Just got off the phone with Kosciuszko Tourist Park, my parents and I are booked in for our annual ski trip at Perisher Blue (and maybe a sneaky day at Charlotte's Pass). It will be my 25th year down there, and I'm only 28. Apparently, Australia had it's "second worst start to a season in 21 years". Naturally, the headline doesn't tell the full story. Both Perisher and Thredbo have been making snow at an alarming rate, opening up whole areas every week. Mount Perisher looked like my backyard 5 days ago, now it looks like a New York blizzard hit it. In fact, they just got their season starter dump of around 50cm, it's looking high quality. Since the age of 3, I've spent a portion of my winters in the Snowy Mountains. We love the place so much we go camping around Guthega every year at Easter. But it isn't home because it's familiar, it's inviting. The lifties are always nice, always have a smile on their face, and are always on-hand to deliver a rocket if you ask nice enough (or provide chocolate). The instructors are something special; I don't know why, they're just kinder and more patient than I've encountered overseas. Knowing how difficult it can be to teach an adult to ski, I've seen them exercise Herculean-levels of patience. It all lends to this community feel. We're skiing in Australia, a country that houses the Simpson Desert and the Nullabour, it's like we are all in on this secret the rest of the world doesn't know about. It's not just the people. The surroundings are beautiful. The drive up to the slopes is iconic, past Sponars, past the slow bus that inevitably turns into Smiggins, up the crest and over into the valley that houses the Perisher car-park, and it's all beautifully laid out in front of you. On a sunny day, at 8am with the slopes basically deserted, it's something special. And that's not even mentioning the wild Emus and Brumbies we catch glimpses of on the drive into Thredbo. (And those in the know will always keep an eagle eye out for the famous "Egg"). And on a wet day when you wake up a bit too late and get stuck in all the traffic, get to the slopes at 11am and you're forced to park along the road and make the full kilometre trek with all your gear to the terminal without slipping over or snapping at your loved ones? That's iconic too, and a rite of passage in Australian skiing. In fact if you haven't just dropped your skis and stocks in frustration at some point during a skiing trip, have you really even skied? Other countries are spectacular, with epic mountain ranges, tree-less runs and huge patches of powder. They look like ready-built ski slopes. The Snowy Mountains looks like a bloke named Dave noticed there was snow on a mountain so he built some lifts. It's so country-NSW; the green and brown, the huge rock formations, the trees that litter places like Centre Valley, and under the Kosi Express. It's just familiar and comfortable. Australian's love to spread out, we're a smaller population blessed with a huge landmass. The layout of a resort like Perisher reminds me vividly of the urban sprawl of Sydney. There are duplex T-Bars, there are two chairlifts on Mount Perisher, there are a variety of rope tows to bridge awkward gaps between runs and areas, and there are hidden gems like North Perisher T-Bar that are so relatively remote it rarely makes sense to open them. Thredbo is a little better set out, as is Mt. Hotham and Falls Creek, but Mt. Buller more mirrors Perisher. There can be some traversing involved to get to different areas, a lot of lifts heading off in weird directions. I love that. 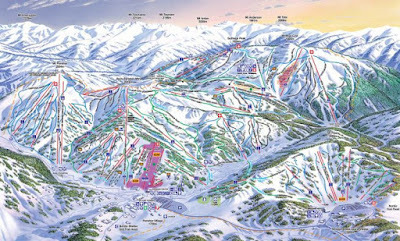 Having skied Cardrona and Coronet Peak recently, I was struck by the structure and order of the layout; runs filtered into the larger lifts, and it was common to be able to ski 6-8 runs that were all easily accessible from the top of a lift. At Perisher, for example, you can traverse hundreds of metres and discover something new and exciting (Eyre Bowl, Parachutes). There is a sense of adventure and discovery. I may have skied every run, but every year brings new conditions, new snow depths, and new people to meet up and follow, and new lines. A friend went skiing in Japan a few seasons back, and promptly declared "You'd absolutely love it! So much powder!" My pride wouldn't let me admit that, compared to how I ski on crisp groomed runs, I am a complete novice in powder. I like to ski fast, to dig my edges in, to brush the slope with my shoulder. We do get dumps in Australia, I remember one year fondly, I was staying on-snow in Smiggins, and we must have had over a metre, and the next day it was like skiing on a cloud. But I got pretty bored pretty quickly, and my legs melted with all the extra work I was putting in jumping around. Skiing Australia means toughing it out during those weeks and months when snowfall is never guaranteed. Warm afternoons coupled with below-freezing temperatures at night equals very crisp and fast runs at 9am the next morning. Busting down Towers for the first run of the day must be what Heaven is like. Hitting insane speeds. It's more thrilling and less technical. Mount Buller is just 3 hours from Melbourne. 3!!! Of course, that's why Melbourne is uninhabitable in the winter, as is Canberra. The slopes are just over 5 hours away from Sydney, which isn't bad at all. There is something comforting about just hopping in the car, putting on a Wiggles CD, and driving down to Kosi through the night so you don't miss out on any slope-time. I tried listening to one of their albums on a flight to New Zealand and the captain said he wouldn't take off until I turned the headphones down or replaced the CD with one from Crowded House. Apparently, it was "anti-social behaviour". The best thing about the location is you can engage in "hit-and-run" trips. Because the weather is so unpredictable in Australia, you could be looking at the snow cams one day, then log in 24 hours later to half a metre of snow, and another metre to come. It might be September 3rd, and you'd forgotten about the snow since your July ski trip ended, but they just got over a metre in 24 hours and no-one is down there. Get on the phone, organise 2 nights in Jindy, get in the car, drive through the night, and ski mid-week powder with no lift lines. You can't just pop over to Whistler, nor can you pop over to New Zealand with 2 hours notice. I did that in 2014. I was sitting having coffee with my dad on a Wednesday morning, and saw that they'd got a dump. I called up Kosciuszko Tourist Park, booked a powered tent site for the Thursday and Friday nights. I drove through the night, got there at 7am Thursday morning, skied 3 days, drove back Saturday night. One of the best trips of my life. Look, Thredbo has some decent hot chocolate on offer, but Perisher's mid station, before 10:30am, is untouchable. I swear for many years my mum and sister only consented to early mornings and early starts so they could get to mid-station before half 10 and grab one of these.